Name: Street Fighter Alpha 2 – Kikouken Bug – ストリートファイター ZER0 2 . This bug is very interesting, because it makes no sense at all. Chun-Li’s Kikouken becomes somes kind of Gadouken-esque Fireball, loosing almost all his range, or becoming just a little spark in the Chun’s hands. To make it works, is kinda easy, there’s no magic behind it, The only condition is that you can only make this against another Chun-Li player. 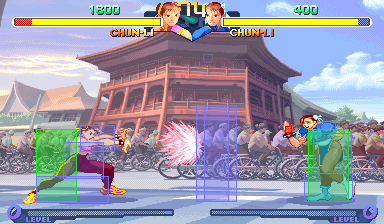 Both Chun’s have to perform her Kikoshou Super Combo at the same time and being like 2 or 3 steps of distance, their arms have to cross each others, and then the glitch is already set. This might be one of the few graphical glitches on the entire game (Arcade Version). This is the result of a glitch that Keiko showed in a video. When two SFA2 Chun-Lis trade Kikoushos, the vulnerability boxes of the projectiles, which are responsible for negating other projectiles, are mistakenly left on screen invisibly. This leaves an impassable, unbreakable barrier to Kikoukens. If someone does another super, the effect is reset. Click Here to read the full article on ComboVid.Com.